Today on the blog I have the very great pleasure and honor of hosting an author I've admired for years. Natalie Whippleis the author of TRANSPARENT, a book about a girl who's born invisible in a world where having super powers can be very dangerous indeed. It made me cry on the airplane. Twice. And it also made me laugh. On the airplane. Once, while I was also crying. The people sitting next to me thought I was insane, and I have never seen anyone leap up out of their seats so quickly after landing. While I loved the set-up of the book--invisible people are awesome, yo!--the scene that was the most powerful to me was also the most human, and had nothing at all to do with super powers. Hurry up and read this book so I can talk to you about how awesome that scene was (which, sadly, is also totally spoilerific and I can't talk about it here). I see all my characters as cartoons. This is an inevitability, since animation has been a big part of my life. Okay, it still is. Give me an animated “kiddie” show, and I will gladly watch it and revel in the art and how it gives mood to the story. Let me watch anime over CW dramas. Please, for the love, don’t make me “grow up” and stop watching cartoons. The truth is, I’m pretty sure animation has had a bigger impact on my writing than books. I wasn’t a ravenous reader growing up, like many of my fellow writers. Don’t get me wrong—I loved stories—but I found something infinitely more interesting when it was a piece of art, whether moving or still. I gravitated to comics adapted into animated TV shows, like my beloved X-men and Spiderman. I gobbled up fun stuff like Teenage Mutant Ninja Turtles, Ghostbusters, Dexter’s Laboratory, Rugrats, Invader Zim, and The Powerpuff Girls. I had to see every Disney movie, and I still remember when Pixar released Toy Story. Blew. My. Mind. Anime entered my life fairly early on, thanks to my mom finding My Neighbor Totoro, Kiki’s Delivery Service, and Castle In The Skylong before Disney bought rights to them (and subsequently butchered the English dub of Totoro with the Fanning sisters, ugh). Then I found Sailor Moon, and it was all over. Anime became my art of choice from about 12 years old and on. I devoured any anime I could get my hands on. I pretty much dedicated my teen years to becoming a better cartoonist, creating dozens and dozens of characters that I swore someday I’d write a real story for. And I did. The people I drew inspired me to write “episodes” of the anime I would someday create. My friends would read them and beg for more. I still have some of those old, horribly written pages—my first real attempt at long fiction. Eventually those episodes became chapters, and the chapters became books. 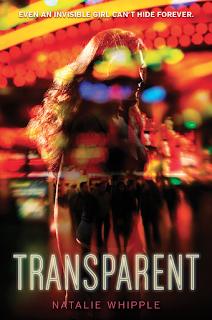 My first published novel, Transparent, is debuting now, and I think it’s safe to say that anyone who reads it will see the comic/anime influences. Honestly, all my writing is unavoidably infused with the art I’ve spent so much of my life creating. Scenes unfold like comic action sequences in my head. My characters have exaggerated cartoon features when I imagine them. I think even my chapters end where I imagine a “commercial break” would come. So yeah, my writing is very much informed by my art, and I suppose my art is informed by my stories. They’ve always gone together for me, and I think it gives my books a unique flavor. And since I’m talking art and words today, I had to draw something special. The picture in this post is from Transparent,specifically Fiona’s first day of school. 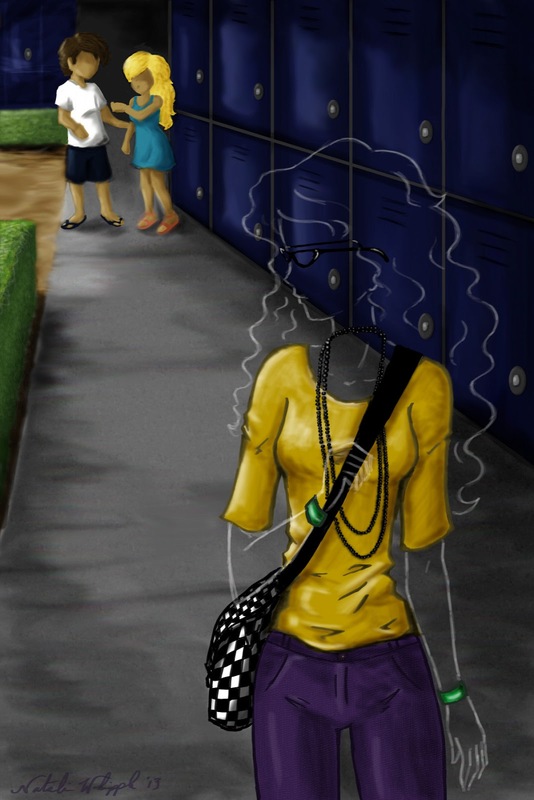 I had a lot of fun trying to create an image for an invisible girl. All these years I haven’t actually drawn her because I wasn’t sure I could do it justice, but I hope you like what I came up with. Thanks so much, Beth, for hosting me today. It means a lot that you’d let me use your blog space to talk about myself. You’re so generous like that. There are many thingies happening in the immediate future! Thingies that I want to make sure to share with you! First: Charleston. Or, as I will no doubt be calling it, Chah'ston. Like "dahling." If you're in the Charleston area, please come say hi! And also--I won't be at this year's Y'all Fest, and this is the only thing I've got planned for the area this year. Just a heads up, since I've been at all the previous Y'all Fests. TEENS Teen Summer Reading kicks off with bang at our first after-hours teen event. Skype with authors Heather Brewer and Michael Grant, and meet author Beth Revis in person. We’ll also have a photo booth, a caricaturist, a DJ, snacks, a free autographed book for each teen and lots of other fun stuff. For teens ages 12-18 or entering grades 7-12 only. Attendance is limited to 200 teens. Contact Name: Susan Myers. Contact Phone: 864-596-3506. Contact Email: teens@infodepot.org.Saturday, June 1, 2013, 7:00 PM – 10:00 PM. Headquarters Library. Next! A book launch! For DEFY THE DARK, an anthology edited by Saundra Mitchell, featuring a short story by me, called "Night Swimming." The anthology features some of my favorite YA authors, as well as one of my last stories set in the world of Godspeed, called "Night Swimming," about Kayleigh and Harley and an unnamed (and gender ambiguous) narrator. Defy the Dark on sale! And finally, I have one more event. This is in my hometown area of Asheville, NC, and I'll be with two of my favorite people! With Nova Ren Suma, Stephanie Perkins, and me! I'm super excited about this one--I love having awesome people like Nova coming to my home turf :) And I believe this is her first trip to Asheville....we'll have to do something special her to welcome her to town. 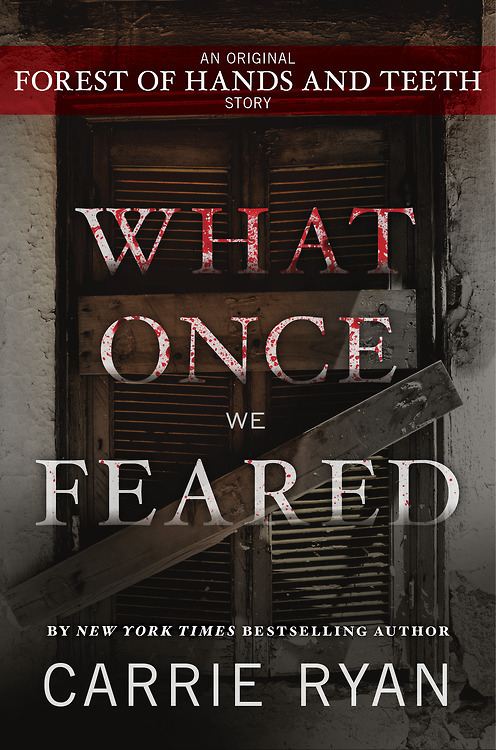 Carrie Ryan's "What Once We Feared"
"I really liked the ending. It was realistic. It's not like everyone ended up driving off in a Winnebago into the sunset. It was cool. It was the way a zombie apocalypse would actually happen. It's the best one of her short stories I've ever read. I don't know. I just really liked it. When you type that all up, make it fancy and make it sound good. I don't word. I don't know how to say it. I just really liked it." For the record, this is my fave Carrie Ryan story, too :) You can read more about Carrie's inspiration for the story here and you can buy your own copy here--just $1.99! So, the husband and I were recently watching Doctor Who, as we are wont to do. Well, actually, several of them. Sadly, in the past few seasons, the Doctor's been riddled with them. Rules are established in one episode and ignored in another. Characters feel one way, then change their minds with seemingly no reason. Logic sometimes fails. Now, first things first: no writer is perfect (and no show is, either). But thinking about my issues with Doctor Who led me to this comment showrunner Steven Moffat tweeted, and that led me to the idea for this post. 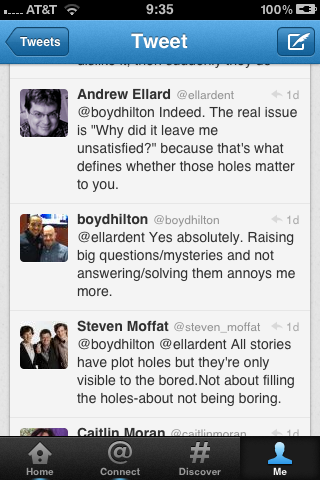 Moffat makes an excellent point here--actually, several. First: All stories have plot holes. Cracked has a great (nsfw) article on 5 Gaping Plot Holes many movies have that we easily forgive. Of course we don't really question why all the bad stuff happens to the same guy in all the Die Hard movies. Despite the fact that Joss Whedon made fun of it in Cabin in the Woods, we forgive the horror movie victims when they split up and go down the dark alley alone. All stories have plot holes. When creating a story, one thing the writer must consider is believability. All stories require the reader to suspend his or her disbelief for a certain amount of time. And the reader will forgive certain things. Is it really likely that everything happens to the main character in a short amount of time? No. Is it really likely that a teenager can solve all the problems in a YA novel? Honestly, not really. But the thing is, in a story, we're likely forgive certain things. We know we're reading a story, so we're okay with the timeline being shortened or the characters being quick witted, because we want the story. There is, of course, a limit to the reader's suspension of disbelief. In a fantasy, we'll believe in magic for that world, but there needs to be a system to how that magic works--you can't just wave your wand and have everything fall into place. In a sci fi, we'll believe in warp drive, but (unless you're Anne McCaffery) don't add dragons. And a contemporary romance can have a happily ever after, but probably not Jedi mind tricks. It comes back to logic. There's a famous principle applied to writing called "Chekhov's Gun"--it comes from Chekhov's famous quote in which he says that if you see a gun in the first act of a play, it must be fired before the end. In this conversation, what it means is that you have to layer in the clues. You need to show the possibilities before the characters live them. If you set rules for your world, you have to follow them. Let's go back to the second part of Moffat's tweet: "[plot holes] are only visible to the bored." As long as the reader is entertained, the suspension of disbelief works. When I'm reading a romance, I want my happily-ever-after, and I'll forgive a pile of coincidences to make it happen. But every reader has a limit. When the reader reaches that limit, however, there's no going back. Therefore, establish the rules, the logic, the world, and the characters, and follow the rules you, as a writer, make. That said: story comes first. While it is true that I've descended into a loop of pointing out the plot holes in Doctor Who with my husband, it's also true that I'm on the edge of my seat waiting for the next one. Plot holes exist in all fiction. How many and how big is a judgment call on the part of the writer--just be aware of what you're doing, and the choices you make as a writer. This post is a part of my series on writing. 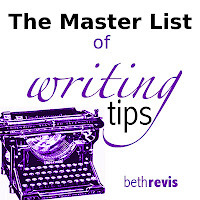 You can find the rest of the writing tips and information here. 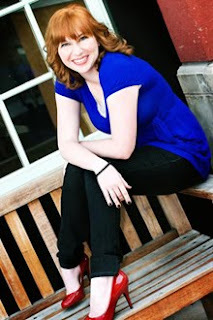 YA ICONS TOUR: Take me to Your Reader! Friends don’t let friends tour alone! That’s right, in honor of the May 7th launch of ICONS, Margaret Stohl’s new sci fi series; she’s called up some of her most iconic friends – who also happen to be some of your favorite authors. And so, if you happen to live in LA, San Francisco, Seattle, Salt Lake City, Provo, NYC or Charleston – they’re coming to you! The tour launches on May 7th in San Francisco at Books Inc.
Icons is set in a post invasion world where people fear the unseen aliens that now control them. The story follows Dol a grass girl who leads a simple life away from the Hole, what used to be Los Angeles. Dol is not a normal teen, she somehow survived The Day when no one else in her family did. Along with Ro, another orphan from The Day, she stays hidden from the world at the Mission. But not all is what it seems with Dol and Ro. They are a secret hidden away from the Ambassador and the rest of the world. When Dol and Ro are taken to the Embassy they discover they are not the only ones who are special. Caught between the known and unknown Dol must decide who she trusts and just how far she is willing to go to save the only home she knows. San Francisco – Tuesday May 7 at 7:30 pm – Icons Launch at Books Inc – A Not Your Mother’s Book Club (NYMBC) event – Margaret Stohl with Andrea Cremer, David Levithan, NinaLaCour. San Francisco area – Wednesday May 8 – Keplers – Margaret Stohl with Melissa de la Cruz, Leigh Bardugo, Kim Derting, Kami Garcia. Seattle – Thursday May 9 at 7:00 pm – Pierce County Library – Margaret Stohl with Leigh Bardugo, Kim Derting, Marissa Meyer. Seattle – Friday May 10th at 6:30 PM – Third Place Books – Margaret Stohl and Kim Derting in conversation with a Special Guest Moderator. Details TBA. Los Angeles – Saturday May 11th – Dark Delicacies – Margaret Stohl with Melissa de la Cruz, 5 pm, Signing only. Los Angeles – Sunday May 12th – venue TBA – Margaret Stohl with Ransom Riggs, TaherehMafi, Melissa de la Cruz, Marie Lu, Alyson Noel, Kami Garcia. Salt Lake City – Tuesday May 14th – the King’s English – Margaret Stohl with Ally Condie, Shannon Hale and Stephanie Perkins. Provo – Wednesday May 15th – Provo Library – Margaret Stohl in conversation with Stephanie Perkins. Rochester Teen Book Festival – Saturday May 18th, all day – Nazareth College, Rochester, NY - see website for more information. New York Area (Long Island) – Sunday May 19th – Barnes & Noble Carle Place – 2 pm - Margaret Stohl in conversation with Eliot Schrefer and Barry Lyga. New York City – Monday May 20th – 7 PM - Books of Wonder – Margaret Stohl with Gayle Forman, E. Lockhart, Robin Wasserman, Barry Lyga and Tonya Hurley. Charleston, SC- Thursday May 23rd – Blue Bicycle Books – Margaret Stohl with Beth Revis, Michelle Hodkin, Kathy Reichs and Brendon Reichs – A Yallfest event!